Çelebi, one of Turkey’s premier global brands, is celebrating its 55th anniversary. Rising on foundations originally laid in 1958, the Çelebi Group today is a leading international player employing more than 13,500 people in four sectors in five countries on two continents. 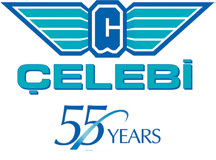 The first privately-owned company to have a presence in Turkey’s civil aviation industry and a leading global name today, Çelebi is proud and happy to be celebrating its 55th anniversary. Launched on 1 February 1958 by Ali Cavit Çelebioğlu with just a single boarding ramp and only five employees, the Çelebi Group is now a preferred and admired participant in national and international markets as a global brand serving customers with more than 13,500 employees in five countries on two continents in sectors ranging from aviation to foods and from maritime operations and services to transport. Having taken up the standard from their father Ali Cavit Çelebioğlu and made the Çelebi Group what it is today, Can Çelebioğlu and Canan Çelebioğlu Tokgöz say that Çelebi’s fifty-five years of honor and pride belong not just to the Çelebioğlu family but to Çelebi employees, customers, and business partners, as well as to the whole country as well.